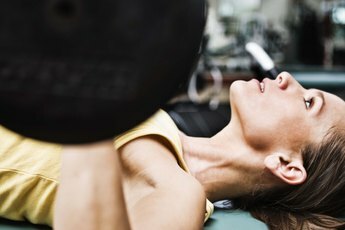 Women lift weights to become leaner and stronger. If you've been curious about woman's bodybuilding, but scared to take up the sport for fear you will become as bulky as Arnold Schwarzenegger, relax -- female genetics limits the size a woman bodybuilder can achieve. The physical benefits of bodybuilding include improvements in circulation, skin elasticity, flexibility and agility, more efficient organ functioning and fat burning, increased disease resistance, improved endurance, and healthier hair and nails -- all of which will actually enhance your femininity. So put aside your fear, and start pumping iron. Obtain medical clearance before beginning an exercise regimen if you have chronic health problems such as injuries, high blood pressure or type two diabetes or you are over 55-years old. Your doctor will advise you on any restrictions that need to be considered when developing your program. Remember, most limitations are centered in your mind, not your body. Get access to weights, either by purchasing a beginner's set, borrowing one or joining a gym. Which option you choose depends on what is most convenient for you. Both can be quite cost effective if you are a savvy shopper. 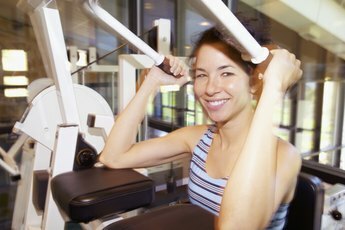 Gyms offer many advantages including having lots of different equipment to try, availability of personal trainers and providing a social atmosphere; however they usually involve paying a monthly fee. If you are purchasing your own equipment, buy two 3.5- to 5 pound dumbbells, a 15-pound bar and an exercise bench. Set a goal. Lisa Lyon, women’s bodybuilding champion, advises women to work on small transformations leading toward larger bodybuilding goals. She gives an example of a realistic women’s bodybuilding goal as decreasing your thigh measurement by an inch over three months. You will be amazed at how much you can accomplish with just a little effort and before you know it, you'll be back in your skinny jeans. Develop a training program. A good beginner's program involves one strength-training exercise for each major body part such as arms, shoulders, chest, back and legs. Complete 10 to 12 repetitions of the exercise two complete times or sets. Although you may be self-conscious at first, relax because before long, others may even be chatting you up for assistance. Determine your correct starting weight for each muscle group. If you can lift the weight for 12 repetitions straining on the last two, the weight is right for you. You don't have to lift the heaviest weight in the gym to see results, you just have to persevere. Focus on good form rather than on adding heavy weight. Most commercial weightlifting machines have diagrams demonstrating good form right on the equipment. If in doubt, ask a trainer or seasoned workout buddy and, remember, Rome wasn't built in a day. Remember to breathe as you are exercising. Breathing never hurt anyone. The basic breathing pattern for bodybuilding is to exhale as you lift a weight and inhale as you lower it. You can recite the mantra "out with the bad air, in with the good" to remember what you need to do. Congratulate yourself every time you achieve a goal. Give yourself a resounding, "You go, girl," and pat yourself on the back. Take baseline pictures and measurements and compare your results every three months to help you keep on track. You'll be amazed at how buff you can look in a short period of time. Begin with light weights and no more than two set of each exercise to get your body used to lifting weights. The bodybuilding adage "no pain no gain" doesn't mean to lift until you break your ribs. Rather, it means push through your discomfort, but if you experience any sharp pains stop lifting and contact a physician. Can Calisthenic Exercises Build Lots of Muscle?